graffiti on streets across the world today. There are some pretty amazing artists out there. They need to hire them so instead of tagging, they are actually decorating. Makes a statement, doesn't it? He's a good artist. I wonder how long it will be before it is dissenting American citizens who are dressed in orange jumpsuits with bags over their heads and detained in the camps Bush has had constructed - or sent to torture centers in other nations. With the powers he and our gutless Congress has granted the prez and the laws passed, it appears that dissention will be illegal soon. "If you aren't with me, you are with the terrorists" sort of thing. This artist is incredible. Soon, he will have to paint our faces when they start rounding up folks we know, the "Have you seen this person?" theme of grafitti. 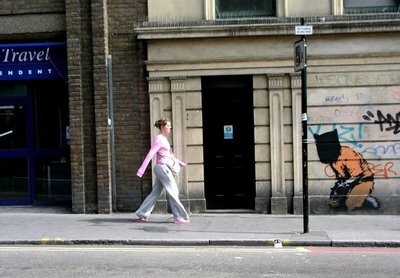 I think Banksy is Nostradamus of Graffiti...great post Gary as always! I find that image disturbing. 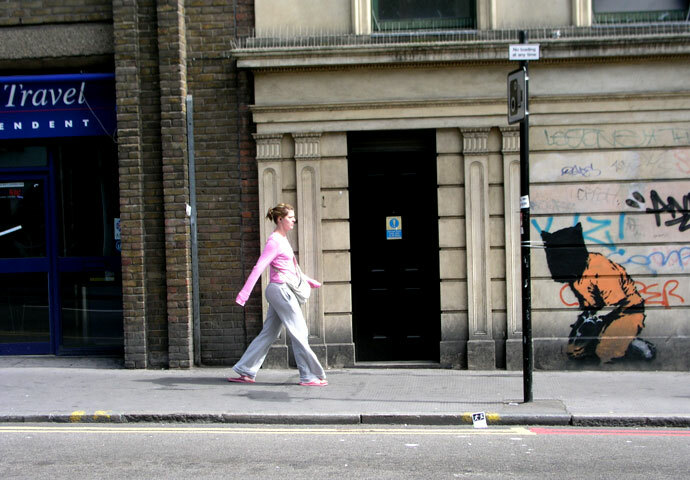 He is definitely an artist, but I would hate to be that woman walking and chancing upon that depiction. Although she doesn't seem to care from this picture. graffiti is so alive, such a vibrant form of art - the visual equivalant of street music, neither can be contained by convention. Vee, you're right, this could be a difficult piece of graffiti to walk by - interesting comment. I do think think, however, that bringing these issues (torture in this case) right to us, is probably on the whole, a good thing.